One thing leads to another. I was working on an article about Pizza. 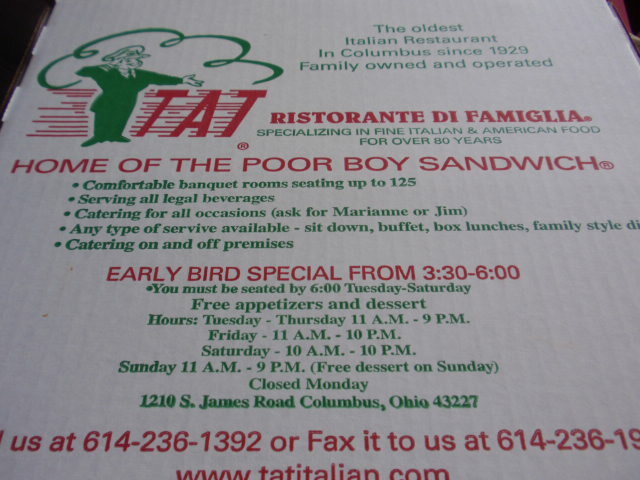 TAT was the first Columbus restaurant to serve pizza in 1929. As I was writing, I recalled I had not been to TAT since 2008. That is too long. I drive by their teaser sign on I-70 during the course of my adventures a couple of times per month. My recollection was Columbus Foodie did a very good write up of the place in early 2011. I wondered if I could find a different spin on the place. After finally going back, I decided I did not need to write anything new. The magic of TAT is the timeless nature of the place. 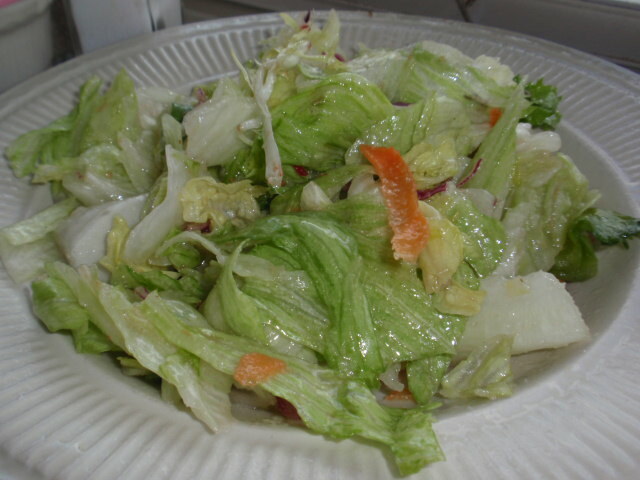 The good elements of the restaurant can not be shared too many times. The fourth generation of Corrova’s as well as members of the third and second generations are still working at TAT. Most family businesses struggle to make it past one lifespan. TAT did, so they must be doing several things right. Many of their servers and employees have been working at the restaurant for decades. Many of their customers have been dining there for decades too. Again, this is impressive. How does this happen? How is a community of owners, employees and customers created at a restaurant? The secret to the business can be figured out over one Sunday afternoon meal. The current location opened in 1978, nothing has changed since then, in fact, the dining room could easily be from the 1950’s, it looks and feels like a time capsule. Consistency is the key here. 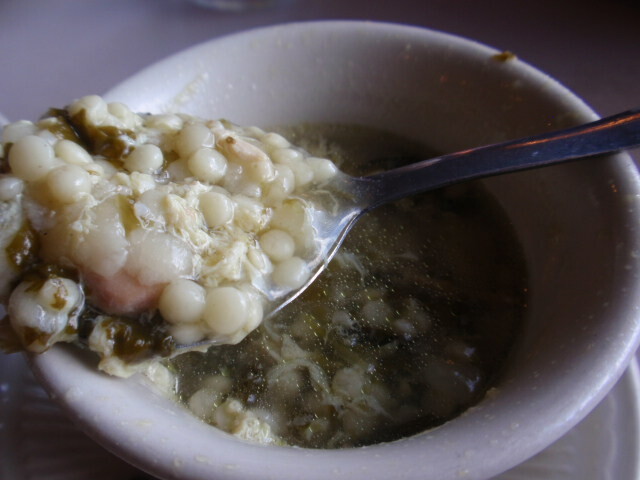 Most of the customers are known by name and eating preferences. Three servers work on each half of the TAT and they know the menu, their tables and their customers. In my time there I was called honey eight to ten times and my shoulder was patted on at least twelve occasions. I felt like I was eating at some Italian grandmothers house and that I was the favored son for eating so much so well. I also give credit to TAT for only serving RC products, the PBR of the cola family. TAT still makes a really good pizza. It is different from the 1929 version. 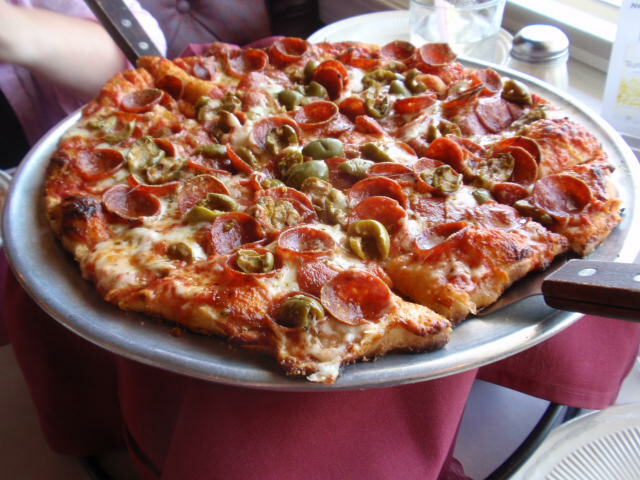 The crust is medium in thickness, crunchy on the edges and chewy on the innards. TAT pizza also passes the next day cold pizza test. I opted for full sensory experience of the Sicilian Delight. Paul and Becke from Columbus Foodie do this spread better justice so take a look at what they had to say. Yes, it was a lot. I did not try to finish it. There is a lot to enjoy at TAT other than the food. 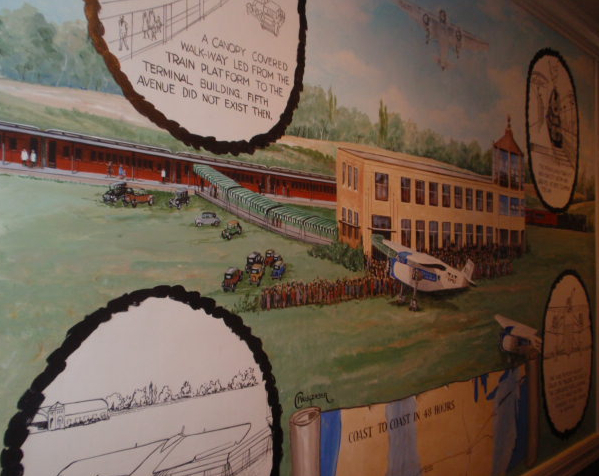 The back hallway houses a mural depicting Transcontinental Air Transport, the first coast to coast airline (with some significant help from trains). The waitresses have many stories to tell if they have a free moment. Owner Jimmy Corrova checks in with as many customers as he can. On the Sunday I visited, it appeared that an African-American church or social event had just ended. Many elderly customers came in sporting great looking suits, dresses and hats. It felt like a cross between the Oscars and the 1950’s – there were top hats, perfectly shined shoes, you name it. It felt classy……I did not feel that way in my Commfest T-Shirt. The sauces are slow-cooked and homemade. Egg Noodles are common, the ravioli appear to be made by hand and there are countless other touches you hope for in an old school, family friendly Italian restaurant. Come for the food, enjoy the atmosphere, appreciate the service and take in a serving of history. 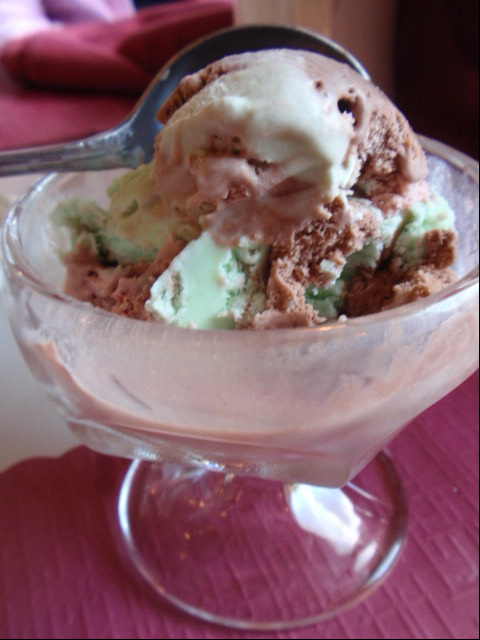 TAT serves a full sensory experience, the food is just a portion of the whole. 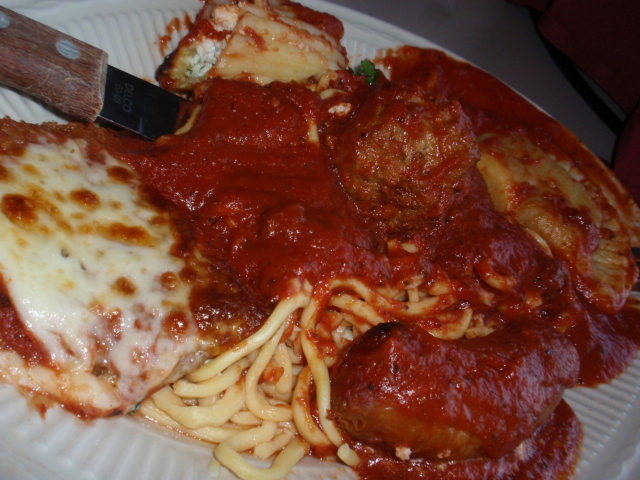 This entry was posted on September 6, 2011 at 12:25 PM	and is filed under pizza, restaurants. 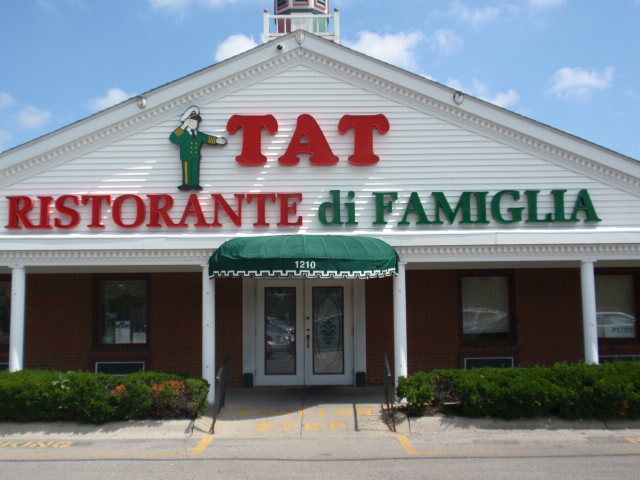 Tagged: TAT, TAT Ristorante di Famiglia. You can follow any responses to this entry through the RSS 2.0 feed. You can leave a response, or trackback from your own site.